Fashion designer Christian Siriano teamed with the Barbie brand for his Resort 2018 collection. 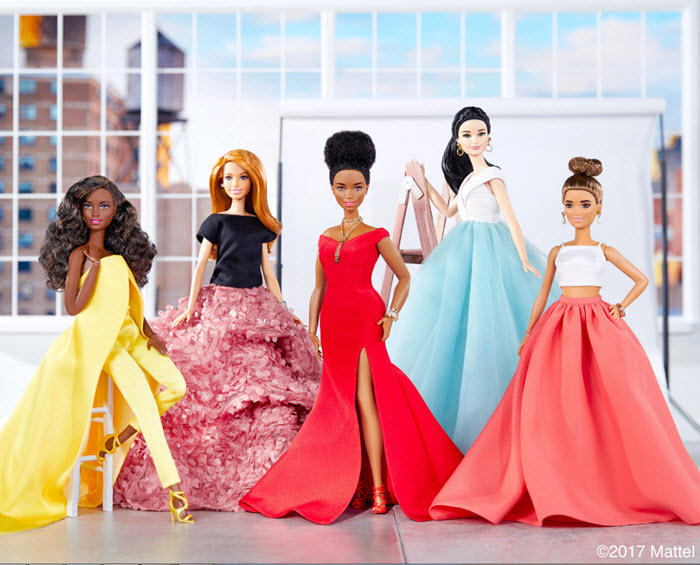 Barbie was Siriano's muse for the collection that showcased red carpet glamour and the different body types and diversity found in the Barbie Fashionistas line. Siriano says in a statement, "Barbie has always been a huge inspiration to me and I'm honored to be teaming up with this iconic brand. It's especially exciting to be designing an array of inclusive and diverse doll looks that can allow girls to see themselves better represented when they play. It was incredible to recreate iconic red carpet moments and dress my latest muse, Barbie, in a new look from my Resort 2018 collection." Mattel first introduced the new body types for Barbie in 2016 when it added curvy, tall and petite body types. Sejal Shah Miller, VP Global Marketing of Barbie, says, "Barbie is a fashion icon—she's been dressed by a multitude of designers over the years who have used her as a canvas to reflect beauty of the moment. We are thrilled that Christian is the next designer to be inspired by Barbie and is showcasing a diverse and inclusive view of red carpet looks." You can view a slideshow of the Christian Siriano Resort 2018 collection on vogue.com.